Towering 6 feet 5 inches over the ordinary, with a face carved in ‘Rock’ and with the musculature of the Greek Gods, it was only a matter of time till this once-upon-a-time pro wrestler Dwayne Johnson was hailed as the Hollywood Hercules. The release of the promos of this fetching movie was more than enough to send waves of awe in infinite women of all ages while witnessing a sudden urgent desire in most men to develop the same build. For the chest, Dwayne Johnson as Hercules has devoted time to flat bench dumbbell press and flat bench dumbbell fly; incline hammer strength press, incline barbell bench press and cable crossover super set with dips. For the arms he recommends tri set, preacher curl with EZ curl bar, standing BB curl with EZ bar and dumbbell curl for the biceps. For the triceps he recommends tri set, exercise rope pushdown, rope overhead triceps extensions and triceps dips. For the back, Dwayne Johnson recommends pull ups, one arm DB row, Hammer strength two arm row, close grip pull down, cable row with double drop set on every set, rope pullovers superset and DB shrugs. Diet to support his exercise schedule while contributing to this stupendous physical frame settles at no less than 4000 calories a day with an intake of 430gms of proteins! Instead of three square meals, the Hollywood Hercules took to 7 small meals a day. Fillet steaks, egg whites, chicken, rice broccoli, asparagus, baked potato, halibut, capsicum, mushrooms and onions form integral components to make this 7 part meal. For many, this information will be tiring enough to read and even more taxing on deciding to follow the same. However, for the eager and the willful, this can be the first step to achieving a shape of their dreams. While it is good to dream, it is even better to understand one’s limits first. Each individual is blessed with a different body type with different height and different possibilities of musculature. So, what works for Dwayne Johnson may send you to the emergency ward if sufficient alterations in repetitions in the workout schedule are made by professionals. 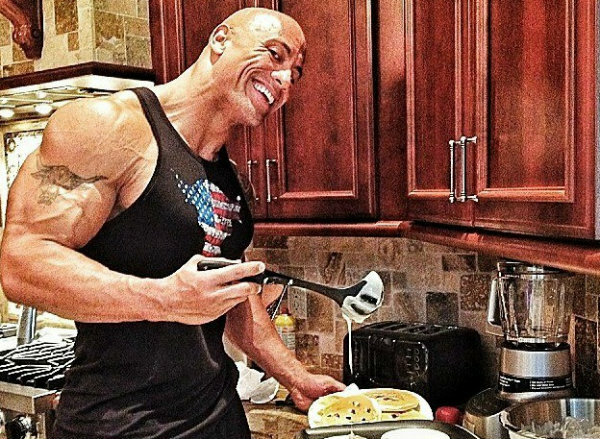 Similarly, based on your height, weight and physical structure, your diet may also differ in many ways from that of Dwayne Johnson to attain a similar physique. Consulting a profession before commencing your schedule will always be a wiser alternative.